Looks like we’re getting some more familiar faces when it comes to our favorite web crawler. 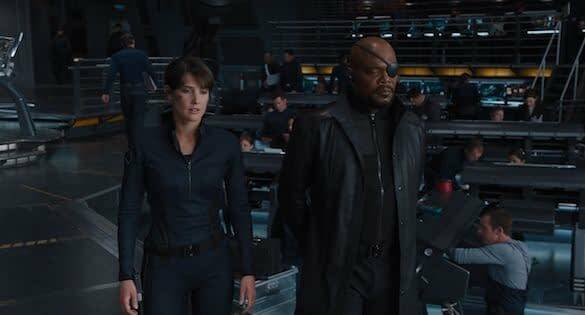 According to Vulture Samuel L. Jackson and Cobie Smulder are returning to the Marvel universe in the currently in production Spider-Man: Far From Home as Nick Fury and Maria Hill respectively. The last time we saw either of these characters it was in the post-credits scene of Infinity War. They were both taken by the snap but not before Nick and Maria. We know that Far From Home takes place after Avengers 4 so that is just another character that we know is coming back from the snap in some way or form. Nick and Maria have been two of the characters with the most rumors surrounding them when it comes to this movie so this isn’t that surprising that it’s finally being confirmed even if Sony isn’t commenting on the casting. This will also mark the second Marvel movie Jackson will be appearing in in 2019 since he confirmed for Captain Marvel. At the moment we know very little about this production since any details could be spoilers for Avengers 4 (it’s existence is a spoiler to some degree). We can expect details to be scarce until next year. Spider-Man: Far From Home, directed by Jon Watts, stars Tom Holland, Marisa Tomei, Zendaya, Michael Keaton, J.B. Smoove, Numan Acar and rumored Jake Gyllenhaal. It will be released on July 5th, 2019.